Christine recently commented on one of my posts with a question about The Concept That Changed Our Financial Life. I am trying to wrap my head around this concept but can’t. Can you possibly explain it to me in a little more detail? Is this an emergency fund or is it in addition to an emergency fund and how do you not use the money? I’ll be glad to try and explain it better. Sometimes I’m not the best with examples. To answer the question, no this is not a use of the emergency fund. It could be, but we prefer the “safety” of having additional funds set aside in case of emergency. Below I contrast how the average Joe earns, spends, and saves money to what we do. Average Joe is living paycheck to paycheck. Money comes in on payday and lasts the next two weeks — just in time for that next paycheck. Joe finds it hard to plan or save any money because he is constantly worried about paying his current bills. If he lost his job, he would be in quite the pickle because more bills would be do soon. We do things a little bit differently. We saved up a monthly “buffer” in our checking account. That buffer is equal to the amount of money you spend consistently each month. If your rent, utilities, food, etc. is budgeted to cost you $2,000 per month then you’ve got $2,000 sitting in your checking account. So on Day 1 of the month, you’ve already got that money sitting in your account ready to be deployed for this month’s expenses. Throughout the month when you get paid, you don’t spend that extra money. You keep it in the account, but it’s as if you’ve put it into an envelope that says “Next Month” on it. You can’t open the envelope until the first of the next month. 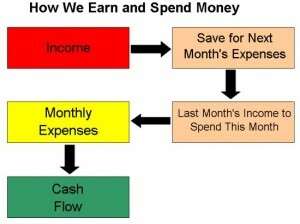 Any additional income you earn over your monthly expenses goes into your savings. 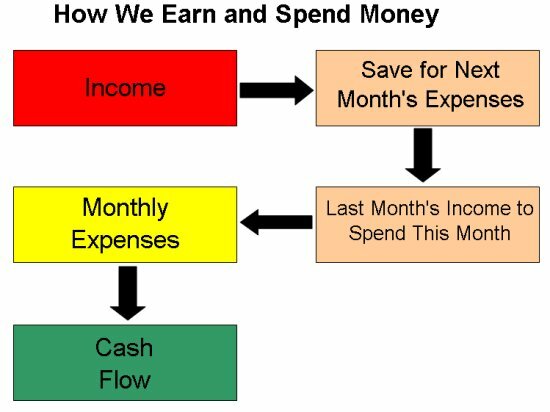 Any money that you don’t spend on your expenses (say your utilities cost $17 less than you expected) also goes into savings. You’ve got your $2,000 in the account ready to be spend on your expenses. The expenses are listed below, sort of like an envelope system. If you write a check on April 2nd for your electric bill, you lower the amount in the “utility” row. If you buy groceries on April 7th and April 21st, on those days you would lower the “Food” row by whatever amount you spent at the grocery store. As you earn income throughout the month, it is “deposited” into the “Deposits for April” row. Remember, you’re not spending that money. You’re spending the $2,000 you already had saved. And you don’t have anything in the savings row yet either. That comes at the end of month. 1. You’ve earned more than you spent on the month — a good sign. 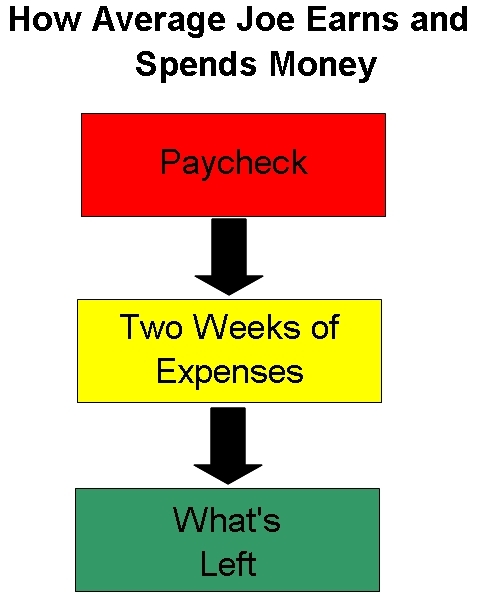 You earned $2,500 this month, but your budget from last month’s money was $2,000. 2. Some of your costs were lower than expected. You saved $38.63 on a combination of spending less on food, utilities, and whatever else you had in your budget. 3. Note you still haven’t spent a dime of the money you earned in April. That $2,500 is sitting up in “Deposits for April” ready to be turned into next month’s budget. Now all you have to do is distribute the money you earned in April for May’s budget, as seen to the right. 1. Note that the total amount of money in your checking account hasn’t moved. You are just moving it from one place to another on a spreadsheet. 2. You’ve taken $2,000 out of your April deposit money (originally $2,500) and distributed it throughout your budget. $800 here, $300 there, etc. This leaves you with $500 left over from the previous month — a healthy amount. 3. You’ve also dropped that extra money you didn’t spend in April — $38.63 — to the To Be Saved line. You would add the $500 income left over as well to this amount, and apply it towards your savings goals. And that’s that. You just went through a whole months worth of budgeting. The hardest part of this whole concept is getting a month’s worth of expenses saved up. It could take a while to save $2,000. In the example above, it would take 4 months if you consistently earned $2,500 per month. Once you’ve got the money saved up, keep it in your checking account (we use ING’s Electric Orange, so we earn interest on it). As money comes in, it doesn’t touch the budget until the next month. Following this concept will also make your life a lot more simple, at least in my humble opinion. We no longer have to time our bill payments based on when our paychecks will hit the bank account. We just pay the bill out of this month’s budget. Christine, I hope this makes it a bit clearer to you. To use this concept, you’ve got to have a budget. 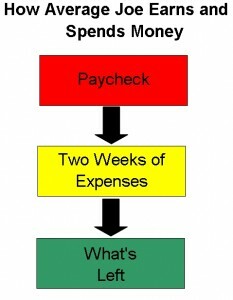 You’ve got to know how much you can spend each month (the budget is the monthly maximum). Of course, if you spend less money, all the better. It drops to savings. Readers, let me know if you have any questions. I’ll be glad to answer them via e-mail or, with your permission, use them on the site. This is why I never had direct deposit. It makes this system harder because the money is sitting right there. I always liked paper checks so that I could physically hold them back until the end of the month and then deposit them all at once. One thing you might look at is a good money market account to stash you money in. It’s easy to get your money when you really need it but not as easy as your check book might be. @Mom and Philip: That’s why I like ING Direct — it isn’t as easy to get access to the money because it takes several days to transfer to my brick-and-mortar bank. @klc: Unfortunately it can be difficult. Living frugally and having a budget is a start. Hey Kevin! Thanks for the comment! You are welcome. I really loved your post and I think that this strategy rocks! It has definitely worked for me in the past! Also, I wish I could say I designed it but is just another blog off the shelf (Pre made — shhh! Don’t tell anyone.) hahaha. Living on last month’s income is a fantastic method to de-stressify your life. Really the best way to work this system is to work up a monthly budget and track your spending against the budget every week. Spend according to what you planned in your budget and don’t go over. Disregard your checking account balance for the most part and spend according to your budget categories. Carry an index card in your wallet, or keep your budget in the back of the little notebook you record your income and expenses with. make a category in your budget called “buffer” and budget some money into it each paycheck. Eventually the “bufffer” will equal one months’ pay and as a result you will really be able to relax and not have to worry that much about timing deposits and payments.